Yesterday’s post on charging for your work sparked some really interesting discussions. If you haven’t yet, be sure to join in the conversation over there (or on Facebook or Twitter). The general premise of yesterday’s post was to think about charging by the project rather than by the hour. One question came up about what to do with clients who are unreasonable. If you’re charging by the project, how do you protect yourself against clients who want revision after revision after revision, with no regard for your time whatsoever? You could say I’m a bit naive sometimes. I know people take advantage of people all the time, but I tend to think that if someone takes advantage of my time, it’s because I let them do it. I say nay. You don’t have clients because you don’t go looking for them. You don’t invest in people and relationships, which over time reveal all sorts of opportunities. So, you first have to realize that if clients are taking advantage of you, it’s your fault. Either it’s your fault for ever taking on the job to begin with (because you knew this would happen) or it’s your fault because you didn’t do the one thing that would’ve cleared all this up. That’s right. I whipped out ALL CAPS for that header. Expectations. Are you setting client expectations appropriately? Do you even think about it? Do you assume they think the same way that you do? It’s your responsibility as the engineer/producer to make sure everybody is on the same page. If the client walks into the studio thinking you just have to stick a mic in front of him and press record, you need to take a few minutes to explain how important mic choice and mic placement are to the recording process. It’s not his fault if he doesn’t know much about recording. And if you assume he does, don’t be surprised if things get awkward later. Likewise, if the band comes in for a tracking day, and they hardly know the songs, they’re not together at all, and they just assume you can “fix it” later, you’ve GOT to set those expectations, too. Yes, you can fix a lot of timing issues in editing (check out Understanding Editing, and I’ll teach you how), but there is absolutely no replacement for a great performance. Editing can help, but the real magic happens when the musicians are prepared. If they aren’t, and they expect you to spend 12 hours editing, you need to make sure they realize how long it takes to edit, and charge them accordingly. Don’t be the arrogant engineer. I hate the arrogant engineer. He talks down to you and treats you like you’re stupid. (Sometimes when I’m playing on a session, I won’t tell them I’m an engineer myself…it’s kinda fun to see how they treat ‘just a musician.’) Be friendly. Take it upon yourself to teach them about the recording process. The session will go smoothly, and the entire recording process will be more enjoyable for everyone involved? Why? Because you set the proper expectations. 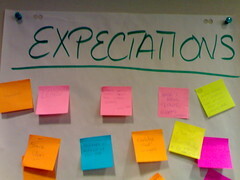 So…how do you deal with customer expectations? Comment below, please.